These shutters are stored in an enclosed box above the window when not in use, and can be lowered using a crank or motor when needed for storm protection. They will also align with the architecture of your home, causing minimal impact on your home’s exterior design. As an added bonus, they provide security, insulation, and light and sound control. If you want your shutters to add a decorative appeal to your home, choose colonial shutters. They attach on the wall beside the windows when not in use, and easily fold together to cover the windows when needed for storm protection. These come in one piece, attached directly above your windows. Simply secure them to the wall when a storm is coming to protect your home. You can also prop them open to shade your windows on sunny days. There’s no need for storage with these shutters, as they remain permanently affixed to your windows. They are easy to unfold to cover your windows when needed. When Majors installs accordion shutters, we take the aesthetic of the home’s exterior into great consideration. The shutters we install will align with the design of your home and won’t be a bulky addition. The most cost-effective option we offer, storm panels cover your windows using bolts or tracks and deliver the hurricane protection you’re looking for without changing the look of your home. We offer storm panels in aluminum and clear options. Majors delivers Red Carpet Service to every customer we serve, which means we will go above and beyond to ensure your home improvement experience is as seamless and stress free as possible. We’ll even leave your home cleaner than when we found it! And, every installer working on your home is factory certified and highly experienced, so you can count on a flawless installation from our team. 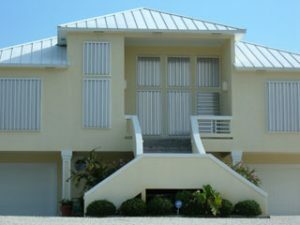 Contact Majors Home Improvement today to learn more about the hurricane shutters we install for customers in and around Pensacola. When you call us, one of our knowledgeable representatives will be happy to schedule a complimentary consultation at your convenience.